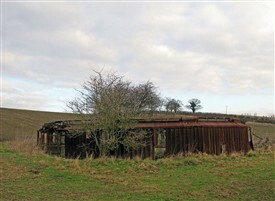 Does any reader remember anything of this site that existed as a derelict wreck after WW2? When I used to go there in about 1948 -1950 there was a metal structure and masses of smashed mirror. This page was added by Bernard de Neumann on 28/12/2013. Sorry to re-open this again but I had a chat the other day with the land owner who happens to be a friend of mine and he confirmed that he removed the foundations of what he called ‘the searchlight’ from the corner of his field at Hambro Hill a couple of years ago. Yes Bernard it was quite early as WW2 defences go. In fact as far as I have been able to find out parts of the structures were actually being built at Christy and Norris factory in Chelmsford before the war. I do not know the date of the aerial survey for the 1939 map, but it could have been quite late in the year. Brian, My memory says the site was nearer to Hambro Hill road than the map shows (somewhere in the garden of the present bungalow), but it was a long time ago. I'll ask an old friend of mine whether he can remember more. If it is the object shown on the map, then that suggests that our government was preparing to defend our skies from intruders in more ways than simply radar pretty early on. However I wonder it it was a water tower, perhaps similar to the one in Thundersley that can be seen from the A13. Such towers are necessarily on the tops of hills, and there is, of course, a more ornate one in Benfleet. I also seem to recall that we at Love Lane School were told that a young boy died in the sandpit - a boy drowned at Battlesbridge Mill after becoming stuck in the mud. I have not measured it myself but I would say the structure at Kit's Hill is about 50 feet in diameter in total. If so it was in the corner of the field behind the modern houses in Hambro Close that were built in the large back gardens of the houses fronting Hambro Hill. Was this the location of the structure that you saw in 1948-50? If so it is also shown at about 50 feet in diameter on the map and the site has not been built on, but is in a field. Brian, Thanks. Can you give any details of the size of the installation at Kits Hill please? The one at the top of Hambro Hill was on the north-side of the road, where there is a bungalow now. It occupied a flat area scooped out from the sand. On the south-side and to the east of the railway line, in the old brick manufactory, was an ammunition plant. Update: I went past the site at North Fambridge on Saturday 11th January 2014 and the structure still survives. I can indeed shed some light on what this structure was, if you pardon the pun! It was one of 50 such installations in this part of Essex constructed in late 1939, early 1940. There was originally a very powerful arc light mounted above and in the middle of each of the structures with 12 large mirrors around it to reflect the light upwards. The intention was to literally light up the sky and make any enemy aircraft visible with the additional benefit of blinding and disorientating the air crew. The system was completed and tested but although it was very effective at lighting the sky it was also found that the light was so bright it was reflected back by any cloud cover and would light up the surrounding area as well making it a well defined target for any enemy bombing and even worse actually help the German bomber crews with their navigation at night! There is one civilian report of one of these sites being bombed minutes after the first test! Following the test the project was abandoned and the central part with the light was dismantled from each site but the outer steel structures remained, I guess that some of the mirrors could well have been broken when this was done.